Eternal Orthodox Church calendar for the 19.04 year 2019. Born in Phrygia of devout parents, he was the son of an officer. Once, Eutychius was playing with some other children of his own age, their game being to write their names on a wall and put beside them the rank that they reckoned they would have in life. When Eutychius' turn came, he wrote: 'Eutychius - Patriarch!' He became abbot of a monastery in Amasea at the age of thirty, and ten years later the Metropolitan of Amasea sent him to the Fifth Ecumenical Council in 553 as his representative. At the Council, he shone like a bright star among the Church fathers, both for his learning and his devotion. When a quarrel arose about whether heretics could be anathernatised after their deaths or not, he supported his belief that they could by citing III Kings (A.V. I Kings) 13:1-8, and IV Kings (AN. II Kings) 23:16. He became greatly liked by both Emperor Justinian and Patriarch Menas. The Emperor very frequently turned to him for advice, and Menas (at that time very rich) designated him his heir and asked the Emperor to ensure that this happened. And so it came to pass. Eutychius governed the Church in peace for twelve years. But then the devil raised a storm against him. This storm reached the Emperor Justinian himself. The Emperor was deluded and fell into the Monophysite heresy of Aphthartodocetism, which taught the falsehood that the Lord Jesus, before the Resurrection, had a divine and uncorrupting body, not feeling hunger or thirst or pain. Eutychius stood firmly against this heresy, for which the Emperor sent him into exile to his first monastery. 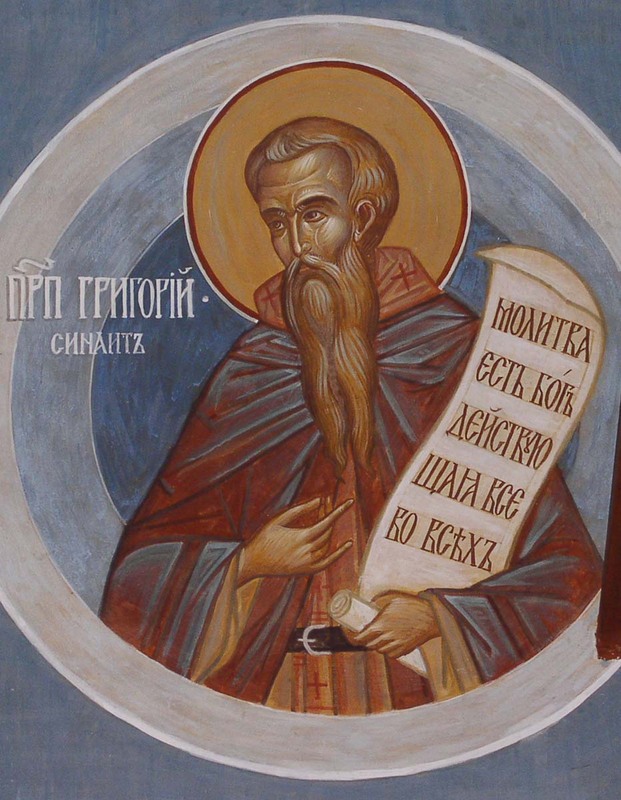 There Eutychius lived for twelve years and eight months, being shown to be a great wonder-worker, healing people of various diseases by his prayers and by anointing with holy oil. Justinian repented and died, and his successor, Justin 11, called Eutychius back to the patriarchal throne, on which this saint remained till his death, governing the Church of God in peace. In 582. at the age of seventy, he went to the Kingdom of Christ the Lord; the Lord whom he had served so faithfully and courageously all his life. When the Persian King Sapor plundered the Byzantine lands, he took 120 Christians into slavery. He put pressure on them to deny Christ and worship fire, but in vain. He then threw them into the fire and burned them alive. 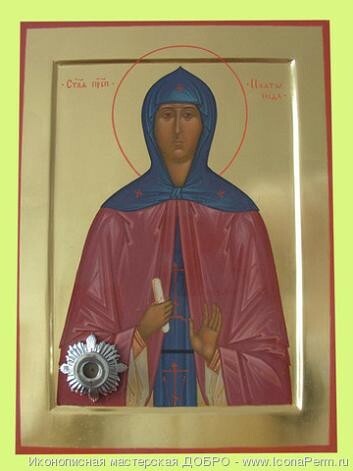 Among these martyrs were nine virgins, consecrated to God. They all suffered with honour between 344 and 347, and went to the courts of Christ the King. Saint Gregory was a native of Constantinople, and pursued an ascetic life on Mt. Athos in the Lavra of St Athanasius (July 5). He was the spiritual guide of St Gregory Palamas (November 14). 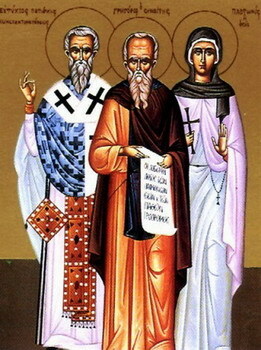 The Holy Martyrs Jeremiah and the Priest Archilius (Alchimius) accepted martyr's death in the III Century. Sainted Gregory Dialogos (+ 604; Comm. 12 March) has an account about them. 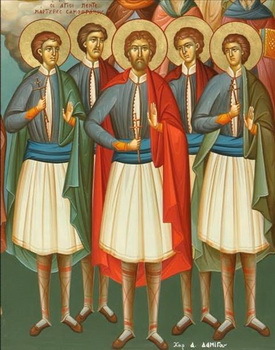 On this day are commemorated 2 Martyrs from Ascalon, buried up to their loins.